It was a bit of a rainy weekend, so there wasn’t too much major gardening going on. Albo installed a new hose reel in the back (got to keep that hose clutter under control), and his mum brought a gift of two tomato plants (Sungold and Pruden’s Purple) and gigantic containers to grow them in. Looking forward to some colorful salads this summer! The step gardens are settling in nicely, and I started doing some soil prep on the west side for a future peony border. 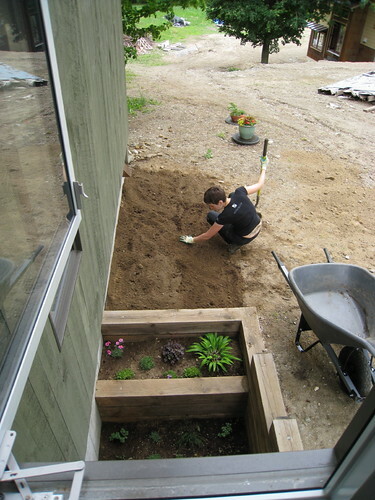 This involved digging out some very sandy, rocky soil and filling in with 75% topsoil and 25% composted cow manure. That’ll be a much happier environment for our plants!